Having worked with Microsoft products for the past 20 years, I always find it challenging to keep up with product upgrades, roll-outs, and licensing changes — and with the advent of the cloud it got even worse. Updates now come on a daily basis. 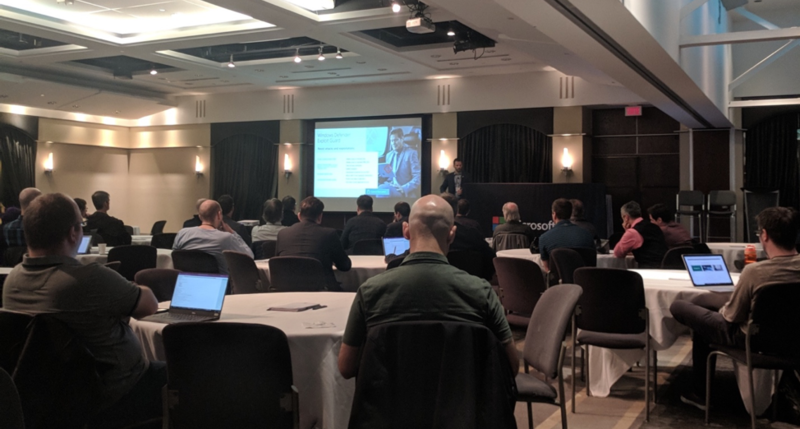 Last week, I attended the Microsoft Montreal Tech Summit and I got the feeling that Microsoft is finally tackling this issue with a more streamlined cloud roadmap model centred around security and productivity. In 2010, what I call the cloud migration rush of initial Office 365 adoption happened. During this, the main concern was to migrate users to O365 and address the changes and challenges from a security or user experience perspective as they arise. With their re-invented user-centric and secured modern workplace approach, Microsoft has focused a lot on cloud security and productivity. From a security and compliance perspective, a couple of new features/announcements that stuck out included Office 365 GDPR Admin Center, OneDrive Files Restore ransomware protection, Multi-Geo O365 data residency, O365 privileged access management and Power BI for security analysis. In fact, the wordcloud picture at the top was produced using O365 roadmap PowerBI plugging. On the modern workplace side, Teams is set to become the IUMC (Intelligent Unified Messaging and Collaboration) client. It was good to see Microsoft Teams new features and SfBO parity Roadmap and the long overdue O365 Canada calling plans. Needless to say, I’m excited to see Microsoft’s plan and look forward to more and easier to manage cloud technology innovation!